Summer is over and things are slowing down enough to do some blogging. This year I had to bring in another boat and Capt. 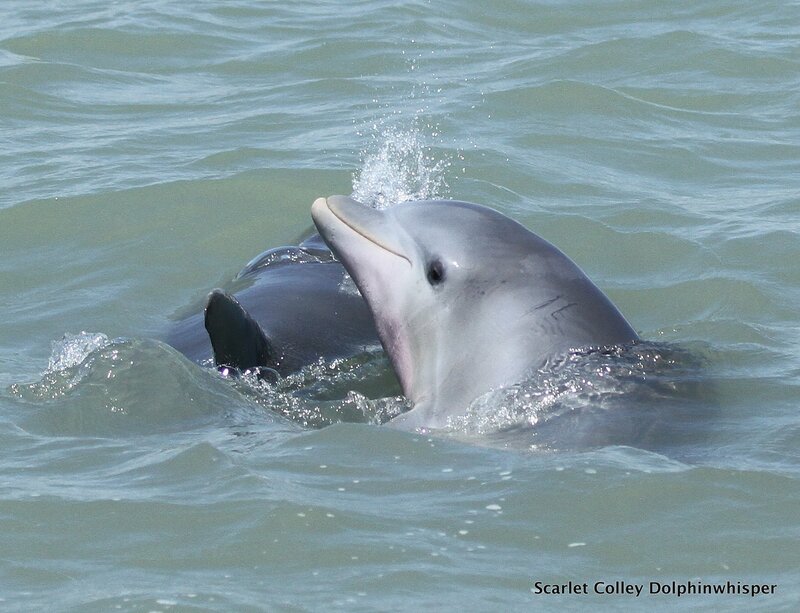 to accommodate all the requests to meet our dolphin tribe. My husband, Capt. George with his dog Gorgi, and I with my dog Rozzi, had full days non stop sharing our joy and wonder of our Laguna Madre Bay family. More families are choosing to take eco friendly tours that do not destroy fragile grass beds by dragging nets. So we have been busy. Because we had many days of clear water in the bay we really enjoyed some terrific views of the dolphins and they seemed to enjoy their great looks of us too. I do post on my facebook and there you will find my photos and videos. Join my on my facebook at Scarlet Colley dolphinwhisper. And if you are heading this way, join my on boat to experience our beautiful people of the sea by meeting them personally. They are intriguing and not to mention a great big shot of JOY! !